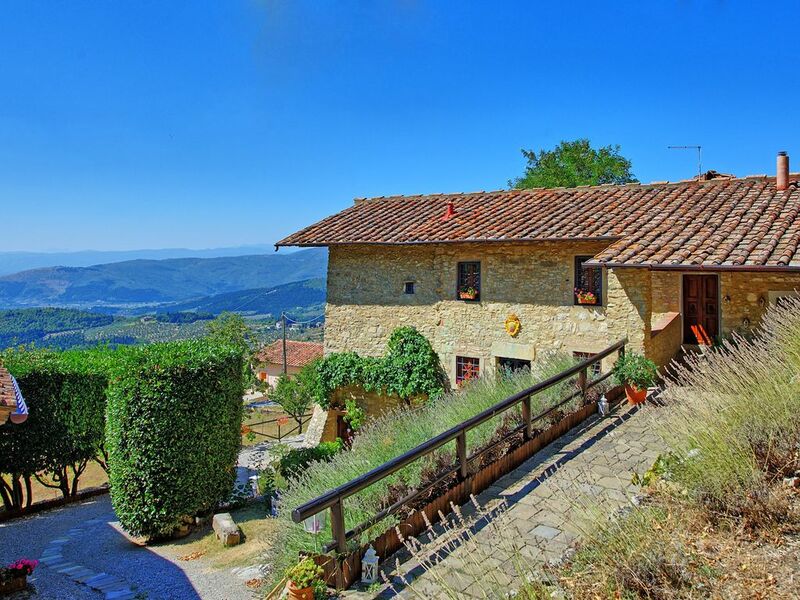 Ancient monastery dating back to the 13th century carefully restored and turned into a beautiful stone country-house situated in quiet and very panoramic location at the foot of Mount Morello, approx. 10 km from Florence away. This property offering splendid views with Florence in the distance, is entirely fenced-in and is surrounded by fruit trees, olive groves and oak woods. The villa provides a nice (1000-square-meter) terraced garden, a beautiful private pool and a small natural pond. On the premises there also is a small farming estate with horses, rabbits, donkeys. The villa interiors are welcoming and tastefully furnished. The property owners live nearby in a separate house, being on hand should the guests need anything. The natural reserve of Mount Morello a short distance away offers an ideal terrain for beautiful walks in the nature. Distances: a food shop is 3 km away, Sesto Fiorentino with general stores 6 km away, Florence (airport and railway station) 10 km, San Gimignano 75 km away, Siena 90 km, Pisa (airport), Lucca and Arezzo approx. 100 km away. At guests’ disposal: large outside furnished areas, private swimming-pool (12 x 5 m – depth 1,4 m – open from 01/05 to 15/10), outdoor Jacuzzi (6 seats; open from 01/05 to 15/10), 2 bikes, barbecue. Free WI-FI internet connection available. Parking for 6 cars within the grounds. The products of the estate (tomatoes, cabbages, zucchini, salad, aubergines…) are available for clients. Extra Services: 2 baby beds available upon request. Maid service by arrangement (12,- / per hour to be paid on site). Upon request it is also possible to organize Tuscan dinners (€ 30,- / per person to be paid on site). The property is composed by a main villa and an additional annexe, rented as a whole to benefit from the exclusive use of the swimming pool and gardens. The main villa is set on 3 floors and being on a hill slope, all 3 levels have direct access to the garden (they are connected from the outside). The annexe is set over one floow. Ground floor: panoramic double bedroom with ensuite bathroom with shower, access to a nice private terrace. 1st floor: living area with sofas and small office corner (computer with internet access and printer), bathroom with shower, double bedroom with ensuite bathroom with shower, panoramic double bedroom with ensuite bathroom with shower, small living-room. 2nd floor: dining-room with fireplace, kitchen (oven, freezer, dishwasher, toaster, American coffee maker), laundry (washing-machine and dryer), small living-room, panoramic double bedroom with ensuite bathroom with shower, bedroom with a single bed, double bedroom with nice panoramic views and toilet, bathroom with shower. Ground flooro: 3 double bedrooms (air-conditioned) each with en-suite bathroom with shower. All of the bedrooms are provided with safe, satellite TV, radio and free WI-FI internet connection (available in the whole villa). The house provides alarm system. inspiring; the peace & quiet rejuvenating. We give Tenuta Lonciano our highest rating! Our group of ten rented 2 cars in FLorence and drove to the Villa. The first time or two up the mountain was unnerving and best done slowly and carefully. By the end of the week we were quite comfortable with it. It was a ten minute ride down the mountain to the train station in Sesto Fiorentino which has a freee, well lit parking lot, and a short 11 minute ride into Florence. The Villa has all amenities you will need, includeing the pool and hot tub and the kitchen was fully equipped with a full size refrigerator. Recommend buying some groceries and wine before heading up the first night. While it is very private, the numerous hiking trails are accessible at the end of the driveway. Daniele arranged dinner prepared for us one night, in house, which was very good and a lot of fun; had a steak dinner one night at LaBottega di Morello (just down the road) which was excellent. It is close to the Villa and accomodated our large group with ease. Our biggest regret was not spending more time at the Villa on the terrace, enjoying wine and the spectacular view. This is definitely a one of a kind property. The villa has phenomenal views and has plenty of space for large groups. Having rooms in the main villa with (3) rooms in the annex does give everyone privacy and room to move around. Having a rental car for the short drive into Sesto Fiorentino to catch the train to Florence or elsewhere is a must and we learned to navigate the narrow roads and turns down the mountain to get into town just fine. Some in our party where directionally challenged to find the villa and their are signs to "Tenuta Lonciano" leading out of Sesto Fiorentino on Highway 130, you just have to look closely for them. Our navigation wanted to take us the long way to the villa and that may be because of the narrow roads on the shorter route. Air conditioning is NOT provided although shown as an amenity on the listing. Fans are provided in each room and sufficed to make our September stay comfortable. There are no screens on the windows and the owner supplied the house with electronic mosquito plug ins. I highly recommend having dinner cooked by the villa. Beatrice and her assistant provided 2 of our most memorable meals and of course the villa setting is the perfect place!!!!! Kudos to their cooking talent!! a little cold still despite the upper 80 to low 90 degree day temperatures. It was fine once you settled into the water. The property management staff and owner were very professional and very helpful and attentive. The historic charm and the beautiful setting set this place apart. Stunning villa with amazing views, highly recommend! There were 14 of us at this villa for our annual family get together. The rooms were all equally beautiful which meant no arguments about who got which one! Daniele was very helpful and we highly recommend having a meal prepared for you at the villa, it was absolutely delicious and there could be no better place to sit and have a meal, looking out at the breathtaking scenery. We had a terrific time in a wonderful location. The garden has an amazing view, the decoration is made with a lot of taste and Daniele is a very caring host.